﻿ ﻿ - Percebes (gooseneck barnacle): Percebes grow on rocks on the north-western Spanish coast, and they are dangerous to collect (that's why they can be a bit expensive). They look like dinosaur claws (I have never seen dinosaur claws but that's how I think they would look) and the way to cook them is to boil them in water. You eat them with your hands, to open them (using your nail) you squeeze the tube right on the base of the shell and take the flesh out. The flesh is like a snail's, but the taste is unusual, delicate but tasty as an oyster. - Sardinas (sardines): I was used to small (canned) sardines, but the sardines in the northern coasts of Spain are huge! And tasty! best way to eat them? grilled and sprinkled with coarse salt. You eat them with your hands, peeling the skin and eating the rest, even the spines. Don't forget to use bread to absorb the grease of the skin and then eat it, delicious! - Ostras (oysters): if you happen to pass by Vigo, make sure you visit a street called Rua de Pescaderia, a street covered with a tent (it rains a lot here) where the ostreiras (oyster ladies) outside the restaurant open the oysters and serve them with fresh Albariño wine. The street is covered , it rains a lot in Galicia so they have a permanent tent that covers the street so people can sit outside. Some say it has become a tourist trap; OK, it can be filled with tourists, but the oysters we had were huge, delicate and delicious. 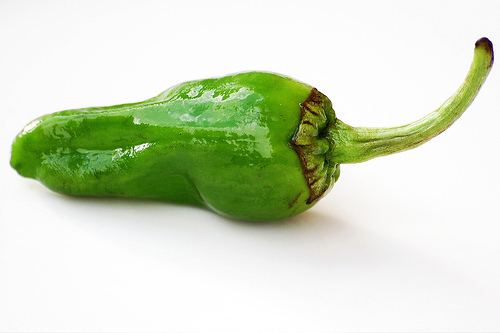 - Pimientos de Padrón (peppers): OK, these are not seafood but they're worth mentioning. These are tiny green peppers from a town called Padrón, fried in olive oil and sprinkled with coarse salt. There's a saying in Galicia: "los pimientos de Padrón, unos pican y otros no" (peppers of Padrón, some are spicy others not), trust me, if you get the spicy ones you'll need liters of water! If the octopus is fresh you must get it perfectly clean and remove the ink sac (your fish vendor can do that for you). Then you place it in a plain surface and beat it with a mallet, I know, it sounds cruel but you must do it in order to make it softer. If you can't beat it then you should get a frozen one, in this case beating it is not necessary. Boil water in a tall pan and when it boils, put the octopus inside completely, then take it out immediately, wait until the water boils again and repeat the process three times. This process is called "frighten the octopus" and it helps to keep the skin while cooking the octopus. Once "frightened", put it back in the water together with the potatoes, a peeled garlic clove, the laurel leaves and a teaspoon of coarse salt. The time of cooking depends upon the quality and the type of the Octopus that you are cooking. Take the potatoes from the water after 20 min. peel them and dice them. I normally leave the octopus boil for 45 minutes per kilo (so in case you have a 2 kilo octopus it must boil at least an hor and a half). Remove the octopus from the pan with the aid of a skewer and leave it to dry for 10 minutes. In the meantime, chop the other garlic clove and mix it in a bowl with olive oil (about 6 tablespoons). Cut the octopus into 2 or 3 centimeter pieces. 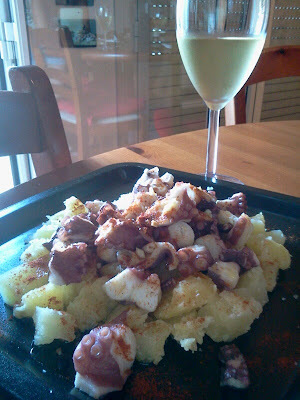 Put the diced potatoes in a plate (wooden would be better), cover with the octopus pieces sprinkle with salt and paprika and top it with the olive oil/garlic mix. Wine pairing: Albariño, Ribeira would be best since they're both from Galicia, but any other dry white wine is OK. Note: Every home in Galicia (and in Spain) prepares octopus differently, some don't use garlic, some don't use potatoes, some cook it in a cooper pan because they say it tastes better, etc. This is my version so, enjoy!